Ford Fiesta’s come standard with a 1.6-liter four-cylinder engine, but an optional 1.0-liter EcoBoost three-cylinder engine was available starting from the 2014 model year if you checked off the $995 option. But, both motors deliver similar amounts of power so why should you spend the extra grand? 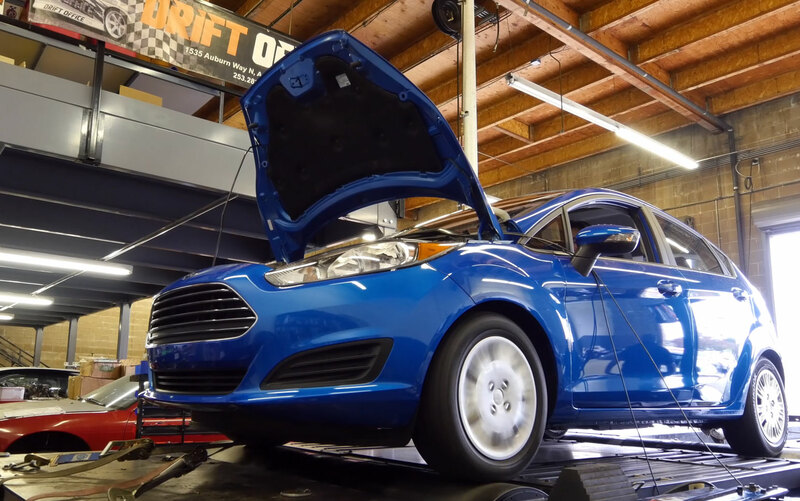 To find out, I took a 2014 Fiesta SFE to Drift-Office in Auburn, Wash. to use its vehicle dynamometer (dyno) to highlight the intricate details of the tiny blown mill. The $995 option only nets you an extra 3 hp and 13 ft.-lb of peak power, which doesn’t seem worth it, on paper. However, the power band reveals the benefits of turbocharging – instant torque and a power band that mimics the sportier Fiesta ST, albeit with less power. Disclaimer: Dyno numbers are lower than manufacture ratings because its taken at the wheels. Manufactures rate power output at the crank. I was only able to test the Fiesta SFE and ST on the dyno. A regular 1.6-liter naturally aspirated four-cylinder wasn’t available, unfortunately. Despite Ford’s rating of peak power at 2,500 RPM, the three-cylinder EcoBoost reaches peak torque at around 2,200 RPM and holds steady until red line for a flat torque curve. A typical naturally aspirated motor generates torque in a linear upward manner that gradually increases the higher the engine revs, which is similar to the horsepower line on the graph. So with the Ecoboost 3-cylinder, you aren’t just gaining 13 lb.-ft. of torque, but also reaching peak torque in half the revs. High horsepower looks great on paper, but torque is what gets the car going. In city traffic, the Ecoboost three-cylinder’s low-end torque makes the Fiesta a lot peppier when you mash the gas pedal. Ford’s 1.0-liter EcoBoost three-cylinder piqued my interest because I’m a big fan of low-end torque. The Fiesta SFE is a joy to drive and I only wish it was available with the ST suspension for a thrilling yet fuel-efficient solution. Plus the 31, 43 and 36 mpg in the city, highway and combined is a healthy boost from the 28, 36 and 31 mpg of the regular 1.6-liter so you get more MPG and smiles-per-gallon.